In A Tramp Abroad (1880), 466. All knowledge is good. It is impossible to say any fragment of knowledge, however insignificant or remote from one’s ordinary pursuits, may not some day be turned to account. 'Address on University Education' (12 Sep 1876) delivered at the formal opening of the Johns Hopkins University at Baltimore. Collected in Science and Education: Essays (1897), 248. Astronomy taught us our insignificance in Nature. In 'Historic Notes of Life and Letters in New England', Emerson's Complete Works: Lectures and Biographical Sketches (1883), 317. Behold a universe so immense that I am lost in it. I no longer know where I am. I am just nothing at all. Our world is terrifying in its insignificance. In Etretiens sur la Pluralité des Mondes (Conversations with a Lady on the Plurality of Worlds) (1686) as cited in Edward Harrison, Cosmology: The Science of the Universe (2000), 162. From a long view of the history of mankind—seen from, say, ten thousand years from now—there can be little doubt that the most significant event of the 19th century will be judged as Maxwell’s discovery of the laws of electrodynamics. The American Civil War will pale into provincial insignificance in comparison with this important scientific event of the same decade. In The Feynman Lectures on Physics (1964), Vol. 2, page 1-11. I see no reason to believe that a creator of protoplasm or primeval matter, if such there be, has any reason to be interested in our insignificant race in a tiny corner of the universe, and still less in us, as still more insignificant individuals. 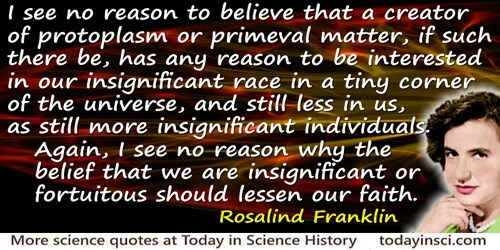 Again, I see no reason why the belief that we are insignificant or fortuitous should lessen our faith. Letter to her father, Ellis Franklin, undated, perhaps summer 1940 while she was an undergraduate at Cambridge. Excerpted in Brenda Maddox, The Dark Lady of DNA (2002), 61. If someone separated the art of counting and measuring and weighing from all the other arts, what was left of each (of the others) would be, so to speak, insignificant. Philebus 55e. Trans. R. W. Sharples. Measurement has too often been the leitmotif of many investigations rather than the experimental examination of hypotheses. Mounds of data are collected, which are statistically decorous and methodologically unimpeachable, but conclusions are often trivial and rarely useful in decision making. This results from an overly rigorous control of an insignificant variable and a widespread deficiency in the framing of pertinent questions. Investigators seem to have settled for what is measurable instead of measuring what they would really like to know. 'Patient Care—Mystical Research or Researchable Mystique/', Clinical Research (1964), 12, no. 4, 422. 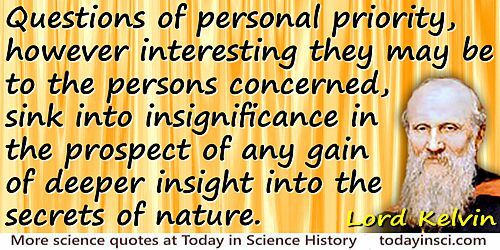 Questions of personal priority, however interesting they may be to the persons concerned, sink into insignificance in the prospect of any gain of deeper insight into the secrets of nature. As quoted in Silvanus Phillips Thompson, The Life of Lord Kelvin (1910), Vol. 2, 602.